Daily Illuminator: Vote For Munchkin Apocalypse! 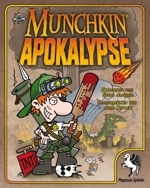 April 25, 2013: Vote For Munchkin Apocalypse! Since its first show in 2007, the Role Play Convention in Germany has continuously grown, and is now, after a move from Muenster to the Cologne Fair in 2009, Europe's biggest fantasy gaming event with more than 50,000 visitors. Just like Gen Con or SPIEL in Essen, the RPC has established its own awards, where the fans can decide what the year's best games of the fantastic genre are. 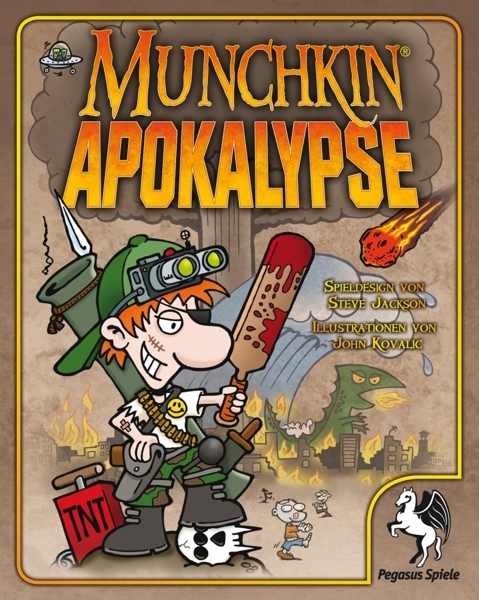 In 2010, the German edition of Phil Reed's Frag won a special Jury Award for the thematic crossover of analog and digital gaming, and Munchkin Quest won the first prize in the category card and board games. A picture of the Munchkin mascot entering the stage after the glorious victory can be found here. The hullabaloo the mascot caused when he began to throw Munchkin Coins and black Munchkin Dice into the massive crowd in front of the stage was epic. Munchkin Apocalypse has been nominated for the parlor games category, which is the second of six categories. Vote by clicking one product in each category; you get to the individual categories by clicking the yellow "Weiter" link. And if you enter you email address at the end of your vote, you join the big raffle with tons of prizes. So show your Munchkinism and make sure the mascot gets on the RPC stage again in 2013 by voting here!